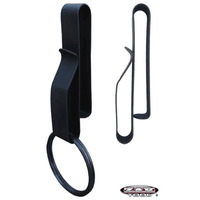 This tactical keyring holder, the ZT55, will fit (slides on to belt) on duty belts up to 2.25 inches wide. One hand operation, steel construction, exceeds 200 lb pull test. Includes large 1.75" stainless steel ring and 1.5 inch black ring. Accessory available: You can order a steel connector clip to keep 2 holders together on your belt. Choose from dropdown menu. 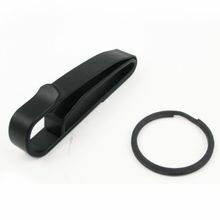 Keyring holder and a 1.5 inch round black keyring plus 1.75 stainless steel ring are included. The ZT52 model (inset or 2nd picture) is a low profile keyring clip (uses a clip design to attach) that fits on a standard 2.25 inch duty belt. This gives you the option to remove without removing your belt. It is made of steel and is designed with a low profile. This Zak 52 model is black and comes with a black 1.5 inch steel ring.